ATLANTA’S CREATIVE SCENE is explosive. Between the groundbreaking street art, dive-bar music venues, independent bookstores with a commitment to staying small, and the city’s own arts-focused hashtag bringing it all together, there’s a tangible creative energy here. But unlike other artsy hubs around the country, Atlanta also operates as a support system, encouraging anyone and everyone to embrace their creative side. Here’s how it all fits together. 1. There’s plenty of space to let your creative mind go wild. 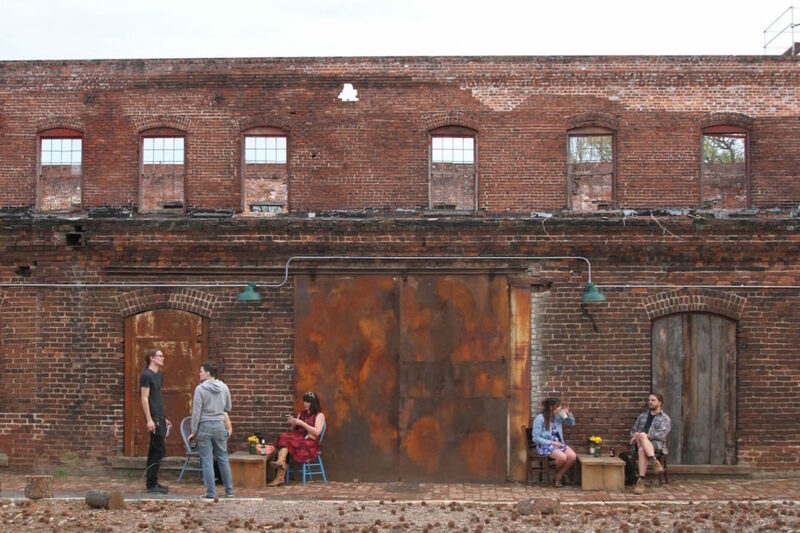 Brick walls and a history of cotton-gin production set the scene for the Goat Farm Arts Center, a space for more than 450 artists, researchers, and other creative minds — all housed in a funky 19th-century industrial complex. The center works to unite science, design, and technology through contemporary art and performance; they host concerts, film screenings, dance performances, workshops, art exhibitions, and experimental theatrics. Fellow creative-space collaborators include The Creatives Project and Mint Gallery, both of which support budding artists by providing them with creative spaces and workshops. Then there’s WonderRoot, another arts organization that’s bringing people together. Their goal is to foster positive social change by providing production facilities to local artists. A little further afield, but still within the Atlanta metro area, is The Creative Hub Atlanta, a co-op workspace for indie and home-based filmmakers. With all this artistic space to explore and utilize, it’s no wonder the creative scene here is erupting. 2. The walls are alive. Living Walls, the City Speaks transforms bland buildings and otherwise dull areas of Atlanta into something awesome. During this annual street art conference, local artists paint murals on vacant buildings (after receiving permission from building owners). The goal is to brighten up the streets, and perhaps sway the opinions of skeptics who might not be feeling the positive impact of street art around the city (yet). 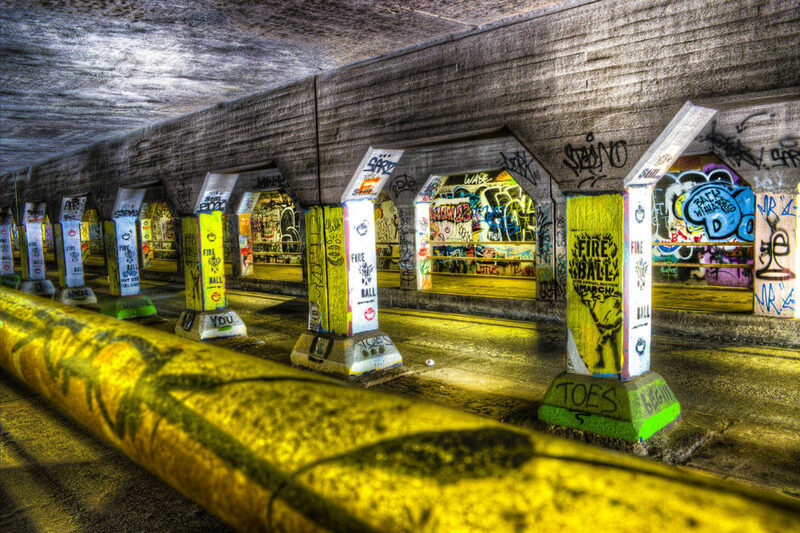 But the growing scene in Atlanta wouldn’t be what it is today without the Krog Street Tunnel. This well-known — and sometimes controversial — tunnel is often filled with the fumes of freshly sprayed artwork in a free art exhibition of graffiti, event announcements, and festival dates. Definitely one of Atlanta’s most original spaces, it’s proposed that the Krog Street Tunnel will eventually become part of the Atlanta BeltLine — a 22-mile railway-turned-hiking-and-biking-trail, complete with art installations along the way. Though not literally on walls, the annual Art on the Atlanta BeltLine exhibition — the South’s largest temporary public art project — showcases everything from hanging mesh-wire sculptures to Bollywood and folk music performances, all strung out along the BeltLine. Each year to kick off the event, 60,000 Atlantans march together at the annual Lantern Parade (this year’s is September 10), illuminating the BeltLine, and the city, with handmade — and super imaginative — lanterns. 3. There’s no shortage of literature here. Atlanta has a tremendous selection of kickass independent bookstores. There’s the 27-year-old A Cappella Books, the “smartest bookstore in town;” their secret for long-term survival is simple — stay small. The Little Shop of Stories calls itself the best independent bookstore for children and adults in the “observable universe,” which is probably true. Then there’s the nonprofit AJC Decatur Book Festival, the largest independent book festival in the country and one of the five largest in the world. It started in 2006, and these days more than a thousand world-renowned authors and hundreds of thousands of attendees come together for book signings, author readings, live music, poetry slams, and writing workshops. As a nonprofit festival, it relies solely on donations, so check it out and leave some cash behind. But the literary scene here is about more than just books that have already been written. For writers, there’s the Creative Loafing Fiction Contest, which offers cash prizes and a published spot in Creative Loafing, and LadyFest Atlanta, an “intentional, queer, feminist space for women and gender nonconforming people” bringing together local artists, writers, and activists to share their work. There are also plenty of open mics at venues around the city, like Java Monkey, a coffeeshop showcasing poetry readings every Sunday. 4. The music scene is on fire. Not only is Atlanta home to some of the most influential rappers and hip-hop artists in the mainstream industry, there’s also an abundance of local musicians and artists with not-quite-national name recognition. Check out HeaveN Beatbox, who’s represented the US twice at world beat-boxing championships, and CLAVVS, a self-described “hypnotic alt-pop duo,” for a sample of local flavors. Best venues to see these artists and other live performers? The EARL, Aisle 5, The Drunken Unicorn, Masquerade, Tabernacle, Terminal West, Variety Playhouse, and The Basement — and that’s just naming a few. Not to mention, you may find the next big voice at an intimate venue like Eddie’s Attic — where John Mayer got his start. The music scene moves fast; Crossover Entertainment, which has been around since 1992, is one way to keep up to date on Atlanta-based and big-name musicians. It’s expanded over the years to include a recording studio, equipment rentals, event management, and full production facilities, and has some star power walking through its doors — think Elton John, the Allman Brothers, Janet Jackson, Beck, and Lindsey Buckingham. It’s not exclusive, though, and you don’t have to be a big-name artist to take advantage. If you want to know the next big thing coming out of Atlanta, Crossover should be the first place you check out. And even if you’re not looking to rub shoulders with the bigwigs or record your own billboard hit, you can still spend endless hours exploring stacks of vinyl at Criminal Records or Wax n’ Facts. The former, a music and comic book shop, sells releases from both mainstream and independent artists; the latter, a self-described “veteran music shop,” sells used vinyl, cassettes, CDs, and turntables. 5. We have Dragon Con. Enough said. A bit like Comic-Con in San Diego, Dragon Con is an intense and gargantuan-sized crowd of diehard fans of science fiction, fantasy, and comic books — but with more dragons. The festival has been drawing passionate nerds to the city for decades. It also hosted the Origins Game Fair in 1990 and the North American Science Fiction Convention back in 1995; in 1999, its TrekTrak event presented the first ever Miss Klingon Empire Beauty Pageant. 65,000 nerds decked out in badass costumes? You’ve never experienced anything like Dragon Con. 6. Hollywood wishes it could be Atlanta. What do Anchorman 2, The Hunger Games, The Walking Dead, Ant-Man, Guardians of the Galaxy, and some 140 other movies and television shows filmed since 2008 have in common? They’ve all been either partially or entirely shot in Atlanta. Yes, there are enticing tax credits on offer, but one of the real deal-makers in the entertainment industry is the Atlanta Media Campus & Studios, which calls itself “the largest film and television media complex outside of California.” And while Georgia is still third in the nation in film production, it’s one of the top in growth, quickly bringing a reputation and name to Atlanta as the next — and cheaper — Hollywood. 7. One of the world’s best art schools is here. The Savannah College of Art and Design was named #1 in the nation for 2014 by DesignIntelligence in its annual “America’s Best Architecture and Design Schools” ranking for interior design programs. And yes, the school’s main location is in Atlanta, not Savannah, where art students the world over get to explore their creative sides. 8. We have our own Atlanta-loving hashtag. #weloveatl is used — by Atlantans and visitors alike — to broadcast our love of the city through photography and art. Since 2012, #weloveatl has worked to connect Atlanta’s creative communities. But Atlanta’s hashtag is different from those of other cities — it also exists offline. There’s a bread-truck-turned-mobile-gallery that pops up around the city, displaying Atlantans’ photos at festivals and community events; and the CNN Center — CNN’s global headquarters — broadcasts #weloveatl photos to their 3 million annual visitors in a video installation in their atrium. What’s more, the hashtag has morphed into its own nonprofit, volunteer-driven organization with the mission of helping locals tell the story of their city. On Instagram, the #weloveatl movement has grown to include more than 450,000 tagged images — and more than 50,000 followers — who all have one thing in common: an intense love and celebration of Atlanta and its ever-growing creative scene.